Displaylink had some new goodies in Taiwan from silicon to demos, nothing amazingly new but all could be quite useful. From lower power to higher speeds, drivers aside USB and wireless monitors are getting close enough to prime time to be useful. None of the demos lent themselves well to pictures, showing that a monitor works is not exactly the stuff of high-tech oohs and aahs of late, so take our word for it that the demos did work. That said we didn’t have a frequency counter in our back pocket during Computex but given the sheer amount of radio noise around the convention center and the W, fat lot of good it would have done anyway. The first demo was about power. 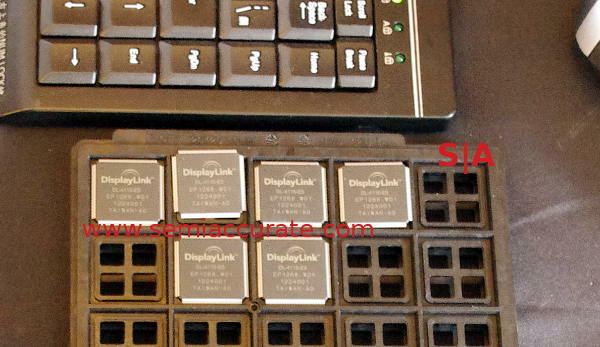 Displaylink had a USB monitor running that pulled only 7W total, low enough to pull power from a single USB3 port. The demo had two of these new panels running and they were indeed pulling only 14W compared to 68 for two conventional monitors. I am not sure the rez on the panels, but I think they were only 1366*768. Still not bad. Related to this four monitor demo we come to the Mac where Displaylink had their devices running on Apples latest coffee shop heartthrob with four monitors on one seamless desktop. It worked like you would expect from a real OS, and could be configured fairly painlessly because Displaylink wrote their own software. The next two demos were similar and each one interesting in its own way. Both were wireless docking over standard 802.11* protocols, one was 802.11AC the other 802.11AD. 802.11AC is the Broadcomm pioneered so called ‘gigabit’ Wi-Fi. Not surprisingly this demo was in concert with Broadcomm, and it does what you think it does, wireless docking at higher speeds than 802.11n. It sounds pretty good and the underlying technology is an 802.11 standard so no serious worries. There are two problems that SemiAccurate can see. First is that 802.11ac gets it’s bandwidth by both using more channels and pushing more data per channel. In the home environment this is OK but in a cube farm or even an office building the 5GHz spectrum will be eaten up in quite a hurry by a small number of 802.11ac clients. The first company that rolls out docking stations via 802.11ac en masse will make for a hilarious case study. 802.11ad is a much more technically viable scenario, it uses the 60GHz spectrum that is in use by next to no wireless devices on the mass market. Why? It doesn’t penetrate walls and objects like 2.4 and 5GHz do, it is effectively line of sight. In a cube farm or dense office environment this is a good thing. High cube walls mean that it won’t have line of sight to the guy next door, but mostly fabric cube walls or light plastic means that it might just do so anyway. I would guess that the number of channels available on 802.11ad are enough to mitigate this problem for the most part over short ranges. Still line of sight wireless is going to be a niche market. Both 802.11ac and 802.11ad wireless docking have one other problem though, power. Most people dock their notebooks to recharge, the rest is far less important. If your notebook doesn’t have power, the USB3 port count is rather superfluous, no? Wireless doesn’t have cables so getting power to the device is a big problem. This was solved on the wired front over a decade ago via RFC3251. If 802.11ac and 802.11ad implement a variant of RFC3251 in their next spec update, all is good. If not, you have to question the basic viability of wireless docking.